WestJet has dropped the price of a few non-stop flights in November from Toronto to Huatulco, Mexico down to $370 CAD roundtrip including taxes. This is about 35% below the typical best roundtrip prices from Toronto to Huatulco. Huatulco is a very laid back and low key destination in Mexico. 3. Click through to the WestJet website. NOTE: This fare requires booking 2 separate one way tickets. Google Flights will provide links to both. The one-way Toronto to Huatulco, Mexico ticket is $228 CAD. 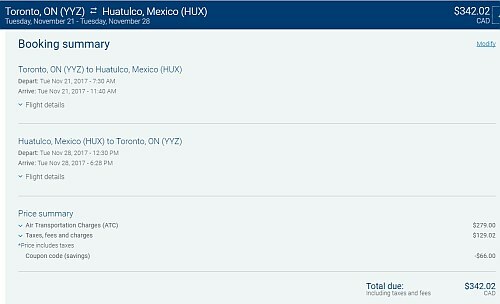 The one-way Huatulco, Mexico to Toronto ticket is $113 USD ($140 CAD). You may want to make sure both fares are available before booking either one. Although WestJet will allow free cancellation within 24 hours, if you book one ticket, but find yourself unable to book the other ticket. - Follow the instructions above. Update 10/31 - Thanks to a WestJet promo code, these flights can be booked for $342 CAD roundtrip including taxes. The WestJet promo code expires tonight at 11:59 PM EST. Where to stay in Huatulco? The map below will show you some great deals on accommodations in Huatulco for under $99 CAD/night for 2 people.